Critical texts of the five known book reviews by Herman Melville are presented in the Northwestern-Newberry edition of Melville's Piazza Tales and Other Prose Pieces, 1839-1860. A previous post featured scanned images of the three pages in the Literary World with Melville's unsigned review of Parkman's The California and Oregon Trail. Here, while we're on a sort of roll, we give you the complete text of Melville's 1849 review, transcribed from the same pages of the New York Literary World 4 (March 31, 1849): 291-293. 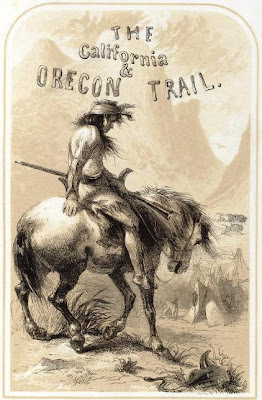 The California and Oregon Trail; being Sketches of Prairie and Rocky Mountain Life. 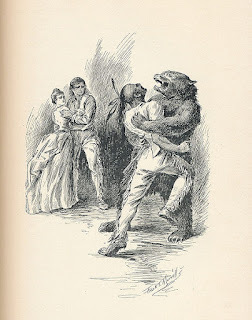 By Francis Parkman, Jr. With Illustrations by Darley. Putnam. MR. PARKMAN'S book is the record of some months' adventures in the year 1846 among the Indian tribes scattered between the western boundary of Missouri and the Rocky Mountains. Though without literary pretension, it is a very entertaining work, straightforward and simple throughout, and obviously truthful. The title will be apt to mislead. There is nothing about California or Oregon in the book; but though we like it the better for this, the title is not the less ill-chosen. And here we must remind all authors of a fact, which sometimes seems to slip their memory. The christening of books is very different from the christening of men. Among men, the object of a name is to individualize; hence, that object is gained whatever name you bestow, though it be wholly irrespective of the character of the person named. Not thus with books; whose names or titles are presumed to express the contents. And, although during this present gold fever, patriotic fathers have a perfect right to christen their offspring "Sacramento," or "California," we deny this privilege to authors, with respect to their books. For example, a work on Botany published to-day, should not be entitled "California, or Buds and Flowers;" on the contrary, the "California" should be dropped. For the correctness of our judgment in this matter we are willing to appeal to any sensible man in the community (provided he has no thought of emigrating to the gold region); nay, we will leave the matter to Mr. Parkman himself. Possibly, however, it may be urged that the title is correct after all—"California and the Oregon Trail"—inasmuch as the route or "trail" pursued by Mr. Parkman towards the Rocky Mountains would be the one pursued by a traveller bound overland to the Pacific. Very true. And it would also be part of the route followed by a traveller bound due West from Missouri to Pekin or Bombay. But we again appeal to any sensible man whether the "Pekin and Bombay Trail" would be a correct title for a book of travels on a region lying East of the Rocky Mountains. In a brief and appropriate preface Mr. Parkman adverts to the representations of the Indian character given by poets and novelists, which he asserts are for the most part mere creations of fancy. He adds that "the Indian is certainly entitled to a high rank among savages, but his good qualities are not those of an Uncas or Outalissa." Now, this is not to be gainsaid. But when in the body of the book we are informed that it is difficult for any white man, after a domestication among the Indians, to hold them much better than brutes; when we are told, too, that to such a person, the slaughter of an Indian is indifferent as the slaughter of a buffalo; with all deference, we beg leave to dissent. It is too often the case, that civilized beings sojourning among savages soon come to regard them with disdain and contempt. But though in many cases this feeling is almost natural, it is not defensible; and it is wholly wrong. Why should we contemn them? Because we are better than they? Assuredly not; for herein we are rebuked by the story of the Publican and the Pharisee. Because, then, that in many things we are happier? But this should be ground for commiseration, not disdain. Xavier and Elliot despised not the savages; and had Newton or Milton dwelt among them they would not have done so. When we affect to contemn savages, we should remember that by so doing we asperse our own progenitors; for they were savages also. Who can swear, that among the naked British barbarians sent to Rome to be stared at more than 1500 years ago, the ancestor of Bacon might not have been found? Why, among the very Thugs of India, or the bloody Dyaks of Borneo, exists the germ of all that is intellectually elevated and grand. We are all of us—Anglo-Saxons, Dyaks, and Indians—sprung from one head, and made in one image. And if we regret this brotherhood now, we shall be forced to join hands hereafter. A misfortune is not a fault; and good luck is not meritorious. The savage is born a savage; and the civilized being but inherits his civilization, nothing more. Let us not disdain, then, but pity. And wherever we recognise the image of God, let us reverence it, though it hung from the gallows. We have found one fault with the title, and another with the matter of the book; this done, the unpleasantness of fault-finding is done; and gladly we turn. Mr. Parkman's sole object, he tells us, in penetrating into the Land of Moccasins, was to gratify a curiosity he had felt from boyhood, to inform himself accurately of Indian life. And it may well be expected that, with such an object in view, the travels of an educated man should, when published, impart to others the knowledge he himself sought to attain: and this holds true concerning the book before us. As a record of gentlemanly adventure among our Indian tribes, it is by far the most pleasant book which has ever fallen in our way. The style is easy and free, quite flowingly correct. There are no undue sallies of fancy, and no attempts at wit which flash in the pan. Accompanied by his friend, Quincy A. Shaw, our young author sets forth from St. Louis, that city of outward-bound caravans for the West, and which is to the Prairie what Cairo is to the Desert. 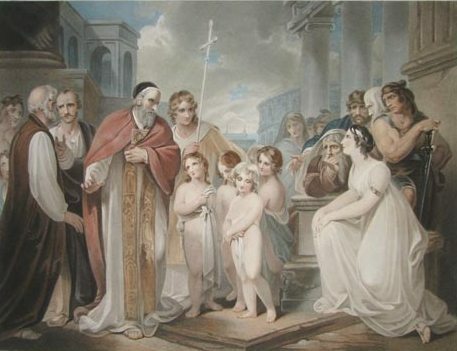 At St. Louis the friends engaged the services of Delorier, a gay, cheerful Canadian, and Henry Chatillon, a hunter, who as guides went out and returned with them. 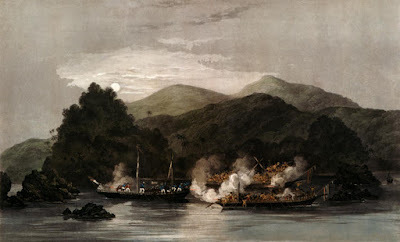 In a steamer, crammed with all sorts of adventurers, Spaniards and Indians, Santa Fe traders and trappers, gamblers and Mormons, the party ascended the Mississippi and Missouri, and at last debark on the banks of the latter stream at a point on the verge of the wilderness. Here they tarry awhile, amused with the strange aspect of things. They visit a man in whose house is a shelf for books, and where they observe a curious illustration of life; they find a holster-pistol standing guard on a copy of Paradise Lost. We presume, then, that on our Western frontier, when a man desires to soar with Milton, he does so with his book in one hand, and a pistol in the other; which last, indeed, might help him in sustaining an "armed neutrality," during the terrible but bloodless battles between Captain Beelzebub and that gallant warrior Michael. From the banks of the Missouri the adventurers pushed straight out into the prairies; and when they cast off their horses' halters from the post before the log-cabin door, they do as sailors, when they unmoor their cables, and set sail for sea. They start well provided with horses and mules, rifles and powder, food and medicine, good will and stout hearts. 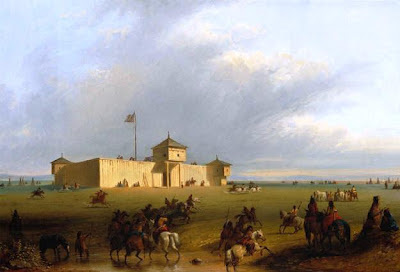 After encountering certain caravans of Oregon emigrants, the first place of note they arrive at is Fort Laramie, a fortified trading post, near a stream tributary to the Platte river. Here, for some days, they lounge upon buffalo robes and eat buffalo meat, and smoke Indian pipes among mongrel swarms of Canadians and Indians. We cannot attempt to follow the friends through all their wild rovings. But he who desires to throw himself unreservedly into all the perilous charms of prairie life; to camp out by night in the wilderness, standing guard against prowling Indians and wolves; to ford rivers and creeks; to hunt buffalo, and kill them at full gallop in the saddle, and afterwards banquet on delectable roasted "hump-ribs;" to lodge with Indian warriors in their villages, and receive the hospitalities of polite squaws in brass and vermillion; to hear of wars and rumors of wars among the hostile tribes of savages; to listen to the wildest and most romantic little tales of border and wilderness life; in short, he who desires to quit Broadway and the Bowery—though only in fancy—for the region of wampum and calumet, the land of beavers and buffaloes, birch canoes and "smoked buckskin shirts," will do well to read Mr. Parkman's book. There he will fall in with the veritable grandsons of Daniel Boon; with the Mormons; with war-parties; with Santa Fe traders; with General Kearney; with runaway United States troops; and all manner of outlandish and interesting characters. There, too, he will make the acquaintance of Henry Chatillon, Esq., as gallant a gentleman, and hunter, and trapper, as ever shot buffalo. For this Henry Chatillon we feel a fresh and unbounded love. He belongs to a class of men, of whom Kit Carson is the model; a class, unique, and not to be transcended in interest by any personages introduced to us by Scott. Long live and hunt Henry Chatillon! May his good rifle never miss fire; and where he roves through the prairies, may the buffalo for ever abound! The reader, too, will make the acquaintance of Mr. Quincy A. Shaw, a high-spirited young gentleman, who always hunted his buffalo somewhat like Murat charging at the head of cavalry —in wild and ornate attire. he sported richly-worked Indian leggins, a red tunic and sash—and let loose among a herd of bison, did execution like our fancy friend, Alp, in Byron's "Siege of Corinth,"—piling the dead around him in semicircles. Returned from his hunting tour across the Western hemisphere, Mr. Shaw, we learn, is now among the wild Bedouins of Arabia. The book, in brief, is excellent, and has the true wild-game flavor. And amazingly tickled will all their palates be, who are so lucky as to read it. It has two pictorial illustrations by the well-known and talented artist, Darley, one of which is exceedingly good. In conclusion, we cannot omit mentioning that the book was put together under a most sad and serious disadvantage. Owing to the remote effects of a sickness contracted through the wild experiences of prairie life, the author was obliged to compose his work, throughout, by dictation. "We had scarcely gone a mile when an imposing spectacle presented itself. From the river bank on the right, away over the swelling prairie on the left, and in front as far as we could see, extended one vast host of buffalo. The outskirts of the herd were within a quarter of a mile. In many parts they were crowded so densely together that in the distance their rounded backs presented a surface of uniform blackness; but elsewhere they were more scattered, and from amid the multitude rose little columns of dust where the buffalo were rolling on the ground. Here and there a great confusion was perceptible, where a battle was going forward among the bulls. We could distinctly see them rushing against each other, and hear the clattering of their horns and their hoarse bellowing. Shaw was riding at some distance in advance, with Henry Chatillon: I saw him stop and draw the leather covering from his gun. Indeed, with such a sight before us, but one thing could be thought of. That morning I had used pistols in the chase. I had now a mind to try the virtue of a gun. Delorier had one, and I rode up to the side of the cart; there he sat under the white covering, biting his pipe between his teeth and grinning with excitement.
" ' Lend me your gun, Delorier,' said I.
" ' Oui, monsieur, oui,' said Delorier, tugging with might and main to stop the mule, which seemed obstinately bent on going forward. Then everything but his moccasins disappeared as he crawled into the cart and pulled at the gun to extricate it.
" ' Is it loaded?' I asked. "I handed him my rifle and rode forward to Shaw.
" 'Are you ready?' he asked.
" ' Come on,' said I.
" The hollow was a kind of ravine very wide and shallow; it ran obliquely toward the buffalo, and we rode at a canter along the bottom until it became too shallow, when we bent close to our horses' necks, and then finding that it could no longer conceal us, came out of it and rode directly toward the herd. It was within gunshot; before its outskirts, numerous grizzly old bulls were scattered, holding guard over their females. They glared at us in anger and astonishment, walked toward us a few yards, and then turning slowly round retreated at a trot which afterward broke into a clumsy gallop. In an instant the main body caught the alarm. The buffalo began to crowd away from the point toward which we were approaching, and a gap was opened in the side of the herd. We entered it, still restraining our excited horses. Every instant the tumult was thickening. The buffalo, pressing together in large bodies, crowded away from us on every hand. In front and on either side we could see dark columns and masses, half hidden by clouds of dust, rushing along in terror and confusion, and hear the tramp and clattering of ten thousand hoofs. That countless multitude of powerful brutes, ignorant of their own strength, were flying in a panic from the approach of two feeble horsemen. To remain quiet longer was impossible. "He sprang off, and I saw no more of him. A heavy Indian whip was fastened by a band to my wrist; I swung it into the air and lashed my horse's flank with all the strength of my arm. Away she darted, stretching close to the ground. I could see nothing but a cloud of dust before me, but I knew that it concealed a band of many hundreds of buffalo. In a moment I was in the midst of the cloud, half suffocated by the dust and stunned by the trampling of the flying herd; but I was drunk with the chase and cared for nothing but the buffalo. Very soon a long dark mass became visible, looming through the dust; then I could distinguish each bulky carcass, the hoofs flying out beneath, the short tails held rigidly erect. In a moment I was so close that I could have touched them with my gun. Suddenly, to my utter amazement, the hoofs were jerked upward, the tails flourished in the air, and amid a cloud of dust the buffalo seemed to sink into the earth before me. One vivid impression of that instant remains upon my mind. I remember looking down upon the backs of several buffalo dimly visible through the dust. We had run unawares upon a ravine. At that moment I was not the most accurate judge of depth and width, but when I passed it on my return, I found it about twelve feet deep and not quite twice as wide at the bottom. It was impossible to stop; I would have done so gladly if I could; so, half sliding, half plunging, down went the little mare. I believe she came down on her knees in the loose sand at the bottom; I was pitched forward violently against her neck and nearly thrown over her head among the buffalo, who amid dust and confusion came tumbling in all around. The mare was on her feet in an instant and scrambling like a cat up the opposite side. I thought for a moment that she would have fallen back and crushed me, but with a violent effort she clambered out and gained the hard prairie above. Glancing back I saw the huge head of a bull clinging as it were by the forefeet at the edge of the dusty gulf. At length I was fairly among the buffalo. They were less densely crowded than before, and I could see nothing but bulls, who always run at the rear of the herd. As I passed amid them they would lower their heads, and turning as they ran, attempt to gore my horse; but as they were already at full speed there was no force in their onset, and as Pauline ran faster than they, they were always thrown behind her in the effort. I soon began to distinguish cows amid the throng. One just in front of me seemed to my liking, and I pushed close to her side. Dropping the reins I fired, holding the muzzle of the gun within a foot of her shoulder. Quick as lightning she sprang at Pauline; the little mare dodged the attack, and I lost sight of the wounded animal amid the tumultuous crowd. Immediately after I selected another, and urging forward Pauline, shot into her both pistols in succession. For a while I kept her in view, but in attempting to load my gun, lost sight of her also in the confusion. Believing her to be mortally wounded and unable to keep up with the herd, I checked my horse. The crowd rushed onward. The dust and tumult passed away, and on the prairie, far behind the rest, I saw a solitary buffalo galloping heavily. In a moment I and my victim were running side by side. My firearms were all empty, and I had in my pouch nothing but rifle bullets, too large for the pistols and too small for the gun. I loaded the latter, however, but as often as I leveled it to fire, the little bullets would roll out of the muzzle and the gun returned only a faint report like a squib, as the powder harmlessly exploded. I galloped in front of the buffalo and attempted to turn her back; but her eyes glared, her mane bristled, and lowering her head, she rushed at me with astonishing fierceness and activity. Again and again I rode before her, and again and again she repeated her furious charge. But little Pauline was in her element. She dodged her enemy at every rush, until at length the buffalo stood still, exhausted with her own efforts; she panted, and her tongue hung lolling from her jaws. "Riding to a little distance I alighted, thinking to gather a handful of dry grass to serve the purpose of wadding, and load the gun at my leisure. No sooner were my feet on the ground than the buffalo came bounding in such a rage toward me that I jumped back again into the saddle with all possible dispatch. After waiting a few minutes more, I made an attempt to ride up and stab her with my knife; but the experiment proved such as no wise man would repeat. At length, bethinking me of the fringes at the seams of my buckskin pantaloons, I jerked off a few of them, and reloading my gun, forced them down the barrel to keep the bullet in its place; then approaching, I shot the wounded buffalo through the heart. Sinking to her knees, she rolled over lifeless on the prairie. To my astonishment, I found that instead of a fat cow I had been slaughtering a stout yearling bull. No longer wondering at the fierceness he had shown, I opened his throat and cutting out his tongue, tied it at the back of my saddle. My mistake was one which a more experienced eye than mine might easily make in the dust and confusion of such a chase. "Then for the first time I had leisure to look at the scene around me. The prairie in front was darkened with the retreating multitude, and on the other hand the buffalo came filing up in endless unbroken columns from the low plains upon the river. The Arkansas was three or four miles distant. I turned and moved slowly toward it. A long time passed before, far down in the distance, I distinguished the white covering of the cart and the little black specks of horsemen before and behind it. Drawing near, I recognized Shaw's elegant tunic, the red flannel shirt conspicuous far off. I overtook the party, and asked him what success he had met with. He had assailed a fat cow, shot her with two bullets, and mortally wounded her. But neither of us were prepared for the chase that afternoon, and Shaw, like myself, had no spare bullets in his pouch; so he abandoned the disabled animal to Henry Chatillon, who followed, dispatched her with his rifle, and loaded his horse with her meat. "We encamped close to the river. The night was dark, and as we lay down we could hear mingled with the howlings of wolves the hoarse bellowing of the buffalo, like the ocean beating upon a distant coast."